This week’s Loose Change comes from Olly Cator, who blogs over at Savvy Dad (savvydad.co.uk) about family finance, parenthood and savvy saving. Olly is a primary teacher and freelance writer living in Norfolk with his wife and two young children. I can remember it well. It was the early nineties, the prized Commodore 64 games system was being replaced with PC’s and everyone in my class had one. Well, at least that was my perception, and my poor parents knew that. From tantrums to pure guilt-tripping, I know I put the pressure on for them to buy one. It wasn’t cheap and I knew it, but I didn’t realise the pressure I was putting on my parents. Now kids, and to an extent adults, can have multiple material possessions in the house that are perfectly adequate and not in need of replacing or updating. However, once a friend has the latest model or new release, the competitiveness can set in to buy. It’s why the unhealthy concoction of children’s TV ads for toys and payday loans has been such an issue over the years. Deal sites online are the perfect example of how our consumer minds can work. We search for the next great deal, find it at 50% off, and then think we’ve saved 50%. Our minds can rationalise and excuse the 50% we are spending because of the perceived “savings”. Did we really need the new item anyway, or was it an “irresistible” bargain? Most material items have fleeting value anyway, like those expensive gift shop cuddly toys I’m sure you all have that are sold for pennies at car boot sales or on eBay years later. Trouble is, we rarely factor in the behind the scenes financing of our peers and neighbours. Your neighbours might be leasing that snazzy new car, or they might have mortgaged themselves beyond their means for their home and maxed out personal loans and credit. I strongly believe, particularly in the western world , that we need to engage our emotional intelligence more when it comes to material needs, wants and whims. Particularly, as money, debts and finances are so closely linked to mental health and relationship issues. 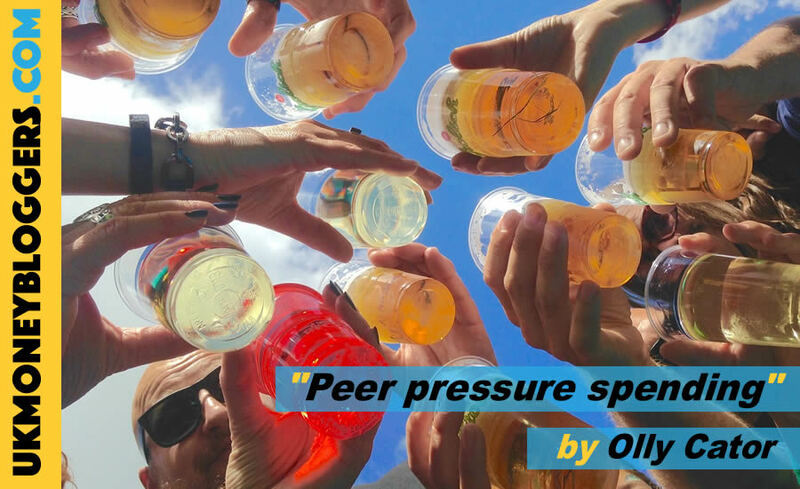 Birthdays and Christmas are the biggest times for peer pressure spending. This is particularly bad when children develop a friendship group once they start school. Imagine 30 children in your child’s class; all those birthday parties, presents and goodie bags. Each parent feeling they need to give their child the same, more, or better than the last. I think it’s important to remember above all else that you’re having the celebration for your child. Attention should be on them for their day, not on what others think or what goodies they take away with them afterwards. It’s not like you’re being rated on tripadvisor for how you cater for your guests, it’s vitally important to realise that. This is vital because every growing family and social group will at some point feel like it has more birthdays, new arrivals, anniversaries and fancy dress non-uniform days to fund than actual days in the year! You simply cannot fund it all limitlessly, and you can’t base your lifestyle on other’s expectations; otherwise you’ll never be happy with what you have in life. “Can I check my diary first?” – Perfect for giving you time to consider if you really want to join in the activity or whether you can suggest a more suitable alternative. “What about lunch?” – Food bills stack up quickly, but dinner bills are often nearly double the price of a light lunch. If possible try arranging lunchtime meets and you’ll feel less like desserts afterwards too. Be honest – nobody who cares truly about you will expect you to stretch outside your means. Happiness is in my view about being happy with life around you and content. If others need more to feel this way, by “Keeping up with The Joneses”, it’s artificial happiness and it can all be snatched away instantly in financially uncertain times. Great post! It’s similar to wanting to lose weight. You need to think of the bigger picture and long term goal. Is that indulgence REALLY worth it?